Ideas and influence travel fast. In today’s globalized information environment, the ability to influence narrative and perception has become, arguably, the most leveraged, participatory, and relevant form of power. That is what this paper is about — the war over hearts and minds, aggressively delivered through guerilla online communications known as “memetic warfare.” A year and a half have passed since it was published. At the time there was significant concern about ISIS’s ability to recruit and spread its message online. Governments were struggling to counter Islamists’ guerilla communications tactics. The journey to writing it began with a simple question: Why aren’t we weaponizing trolling and memetics to fight ISIS and other enemies? I had seen the effectiveness of these crafts in other contexts. Why not use it to destroy ISIS? Thus, this paper aimed to do two things. First, it set out to advance the concept of memetic warfare. 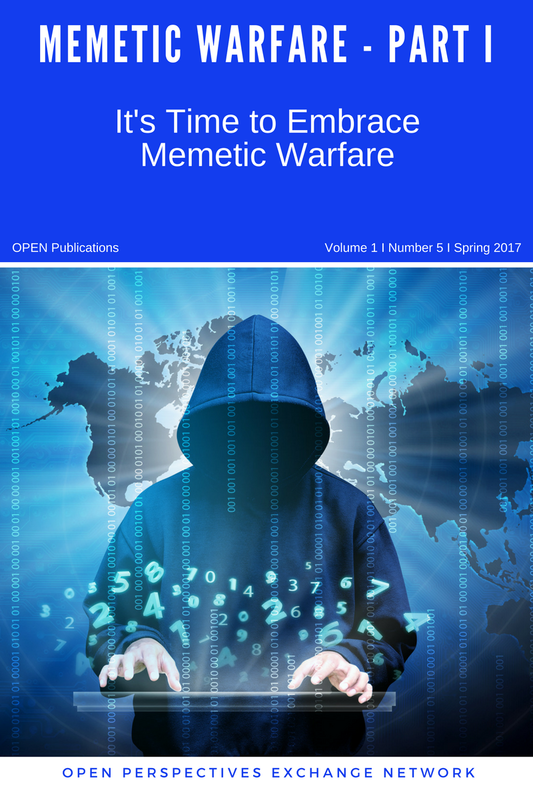 In the same way cyber warfare expanded the military into hacking and security, this paper argues for “a more expansive view of strategic communications on the social media battlefield.” It proposes memetic warfare as a guerilla form of information operations that is needed in our rapidly evolving, social media-driven information environment. The second aim of the paper was to explore the barriers and considerations to making memetic warfare a reality. The intent was to start a conversation about the organizational, bureaucratic, doctrinal, legal, and ethical considerations involved in this. I wanted to push NATO member governments to take memetic warfare seriously as a craft and threat. Today, in early 2017, this paper feels eerily relevant. On March 7th, Wikileaks released a mass leak of nearly 9,000 classified documents that reveal the CIA’s extensive hacking and electronic intercept capabilities. It was the memetic equivalent of a tactical nuke. Instantaneously, the entire world gained access to highly sensitive documents about sources and methods of U.S. national security. The conversation among Americans shifted from the threats of Russian hacking to the threats of the U.S. intelligence community, sowing mistrust and confusion. The Vault7 release happened in the context of a larger discussion about influence campaigns, fake news, and government malfeasance. U.S. lawmakers recently held hearings specifically on how to counter foreign propaganda and information warfare. People are sensing that the battle over narrative is getting dirtier and more intense. The lines between political dialogue, journalism, and information warfare are blurring. Concepts like “fake news” are now in the public consciousness. Memetic warfare offers a conceptual framework to think about these issues. (Click here to read full report).